You can drive all over the greater metro Atlanta area–25 miles* in any direction from the state capital–and not find a public access course better than The Frog (don’t actually try this). While that counts for something, it’s not saying a lot. Atlanta is very nearly an empty set when it comes to good high end public golf. That’s an opinion, of course, but I haven’t met too many people who enjoy driving long distances through heavy traffic to play disjointed, real estate cart-ball courses for $75 a round. That’s mostly what passes for high end public golf around here. Knowing this goes a long way toward explaining why The Frog stands out so much in the Atlanta market, even if you need drive nearly an hour to get there. 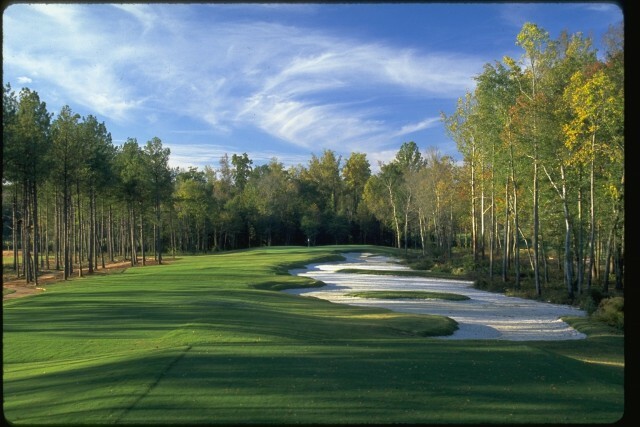 The course is routed on a property welcoming to golf, forested but not overgrown, with relevant but never extreme elevation changes that sheet toward a marshy area of Sweetwater Creek. The holes are also core-routed so there’s little travel between green and tee–a precious commodity in North Georgia. There are no homes or other developments on the property either, another rarity (the course was originally meant to be an amenity to a hotel and conference center that was never built. Now is also a good time to talk about the name–supposedly the original developer thought the course routing map looked like a squatting frog, so…). The first hole is a more studly opener than most players want: a 397- to 457-yard par-4 that rumbles toward a big, convex-shaped green. Some of that initial pain is offset by the short par-4 2nd, a 305- to 370-yard par-4 to another big green set behind a U-shaped bunker. From there the routing goes down to the lower section, back up, then takes a spin around a wetland area that’s highlighted by a stout downhill 223-yard 8th, a one-shotter that must carry a marsh. And so it goes, a nice blend of long, mid-length and short holes, of up and down, of bunkering patterns and green shapes. The course occasionally runs into trouble (the par-4 9th, which feels like an add-on; 14; 15, which can’t quite commit to the strategy it alludes to; and the tee shot on the downhill 4th which is unnecessarily awkward) but throughout there’s sense of calm and expanse that’s hard to find in the competition.